The March 27, 1931 Lima News (Lima, Ohio) ran a piece titled, "Press the Button and Mechanical Man Will Pop Right Up With Meal." 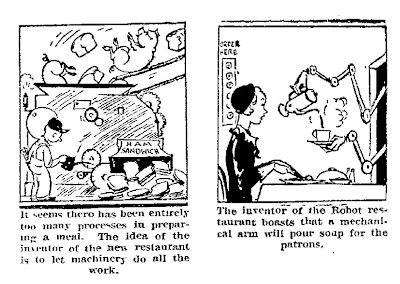 Automation, as we've seen through countless other posts, epitomizes futurism of the 1930s. Robots (a relatively new term in 1931) seemed to often be thrown in for that extra bit of flair. The machine age is about to take command of the world's largest industry - the $23,000,000,000-a-year restaurant business. Hungry patrons will push various buttons representing items on the menu, their orders will be transmitted electrically to kitchen robots which will prepare their food, deliver it, collect the bills, and carry off the dishes. Can't wait to see those paleo-future lawsuits when the robot pours coffee in that poor lady's lap! I'm sure by then there'll be robot lawyers who'll be able to work it all out for us. Some restaurants could be improved by using robots. I'm looking at you McDonalds! I believe a Mr. Wallace and a Mr. Gromit from England have been working on such a machine for years. Not much success as of yet, however. Something in the spring just isn't right. Well dim sum and sushi restaurants have conveyor systems for the meals....and I know of at least a few pizza places that use robots to assemble and cook the pizzas. Nothing so fantastical as an entirely automated restaurant, naturally. When I'm a bajillionare, my mansion will definitely include a pig->ham sandwich machine.